Published: Sun. July 29, 2012 at 7:59a.m. For 17 years I have been going to Geneva-on-the-Lake. Swimming, playing games and walking the strip. For 17 years I have been eating at Eddie’s Grill. It just goes together. Go to Geneva... and have lunch or dinner at Eddie’s. Eddie’s has been a fixture in the middle of the strip since 1950. It is set up as a 1950s-style diner. You place your order, always a cheeseburger and fries for me, and wait until your number is called. While you are eating, you sometimes hear the numbers called over and over because of the number of people who eat there. There are times you can go and wait up to an hour to order and get served. But it is worth every second of wait. Eddie’s is considered fast food, but doesn’t taste like it. The burgers are thin, but the grilled taste rivals any sit down restaurant. The buns are fresh and have sesame seeds on top. The fries are generously portioned and always crispy. And you can wash it all down with an ice cold root beer. Or stop next door and get a lemon icee fr om the DQ. 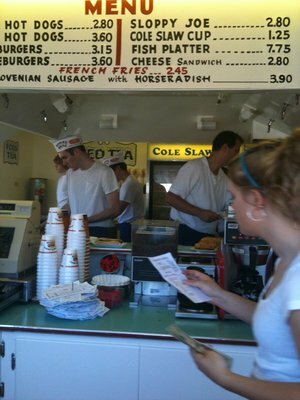 One of my personal highlights when eating at Eddie’s is, after getting your burger, going to the condiment section and loading my burger with onions, pickles, sweet peppers, hot peppers mustard or ketchup -- Always fresh and always plentiful. I always load my burger with pickles, pickles and some mustard -- that’s right, extra pickles. After fixing your burger, you can either sit inside with a jukebox at every booth (and all songs are still a quarter and you can still find those 50s-60s and even current favorites), or eat outside on the patio under an umbrella. Either way you are guaranteed to have a great time and a great burger. I went with my wife and 20-month old daughter this year and hopefully my daughter continues the tradition long into the future. I know I will continue to go back. 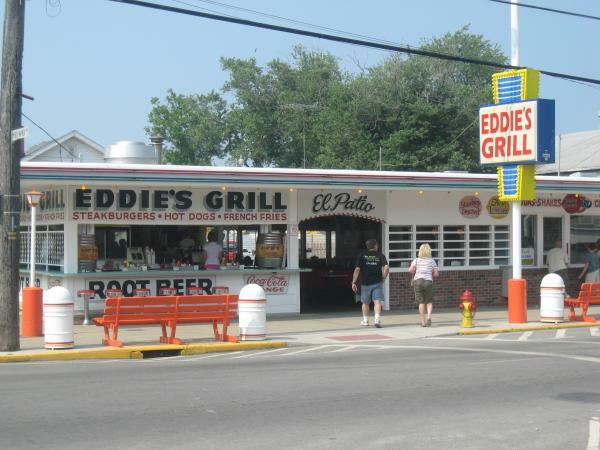 I look forward to our trips to Geneva every year and an Eddie’s cheeseburger. I would rate it 4 stars.